What was once a field of prairie grasses is now a wonderfully ornate, detailed Railway Garden, telling the story of railway history in the United States, particularly in Indiana. Opened in 2011, this unique Railway Garden is sure to become an outdoor educational destination that engages visitors, children, adults, and even school groups, to explore, discover, play, and learn about natural history and horticulture. 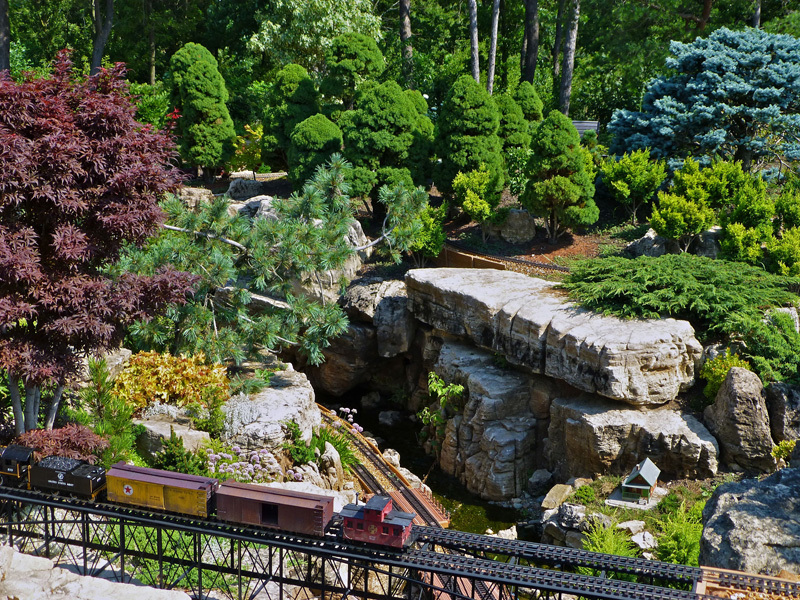 Taltree Arboretum & Gardens Railway Garden is a 2.5 acre outdoor model railway garden. 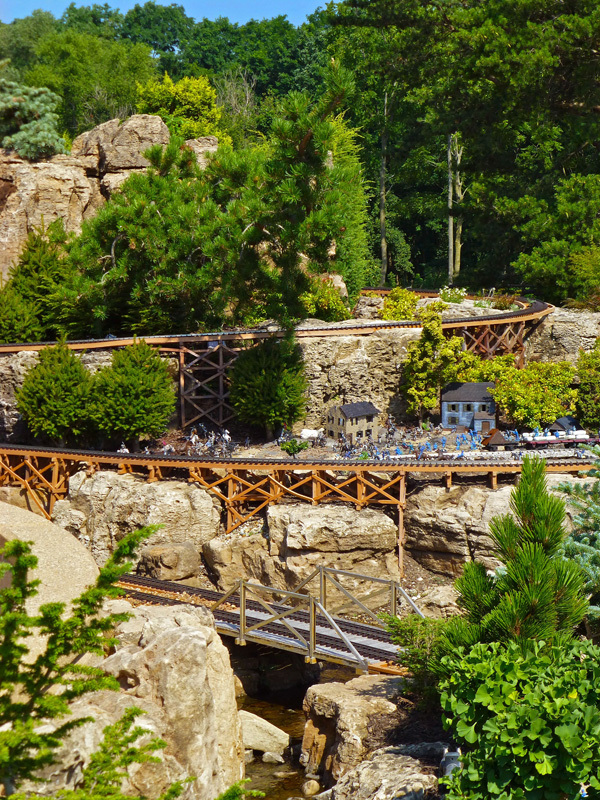 Mountains of natural stone – up to 14 ft high – are set to create a miniature world for G-scale model trains. 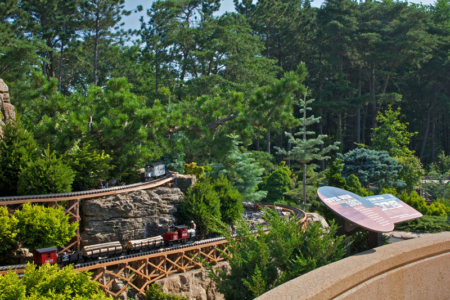 These trains, which are about 1/24th actual size, meander through the scenery on over 3,000 linear feet of track through mountains, valleys, past waterfalls, and along streams. The trains cross over 30 bridges and pass through educational vignettes designed to teach visitors about the impact of the railroads since the Civil War. 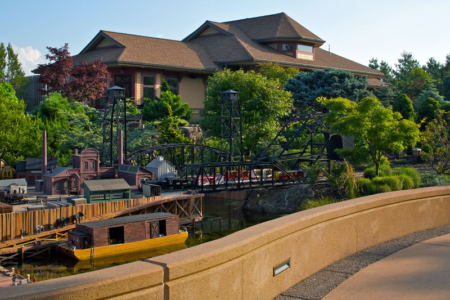 Visitors enter the garden through the Depot building (pictured above), a 1920’s era railway depot with panoramic views of the garden. 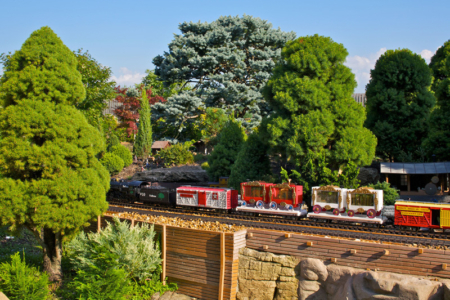 Upon exiting the building, they are immersed in the Railway Garden. 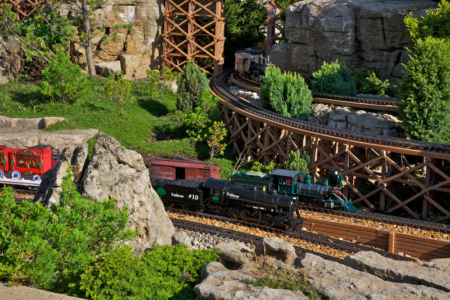 From the mountains, cliffs, flowing gorges and waterfalls, great plains, quarries, and valley floors, the garden explore the story of the impact of the steam railroads in North America. Signs along the large winding walkways urge visitors to look and listen as they stroll through the garden, hearing and seeing the stories it has to tell. The Taltree Project team created a miniature world of mountains, rivers, and valleys out of natural stone. 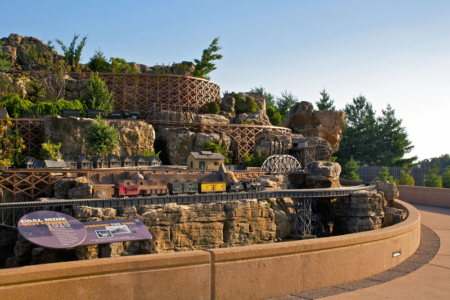 Over one thousand tons of weathered limestone boulders were placed on precisely placed concrete foundations. 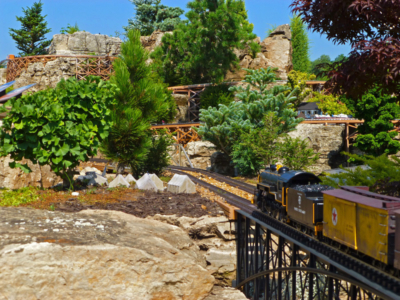 Most of the boulders were hand picked in Oregon or Missouri by the Taltree design team, and freighted to Indiana, complete with moss, with one boulder even having a tiny little tree growing in a crevice. 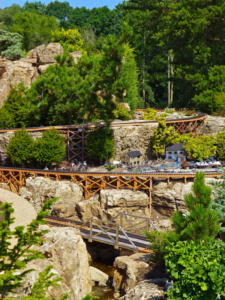 These details lend to the authentic look that Taltree is able to achieve in the miniature landscape. Inevitably, with the use of natural stone, there are limitations to what shapes and sizes the design team were able to find. To accommodate the structural foundations of bridges and foundations of higher boulders, certain concrete foundations were exposed. Faux rock work, a mixture of sculpting, painting, and texturing, was done in these areas to blend the exposed foundations into the surrounding boulders, creating a seamless, natural look throughout. 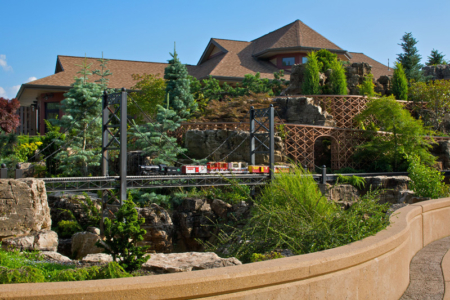 The natural stone used on the Taltree project were placed for more than just aesthetic purposes. 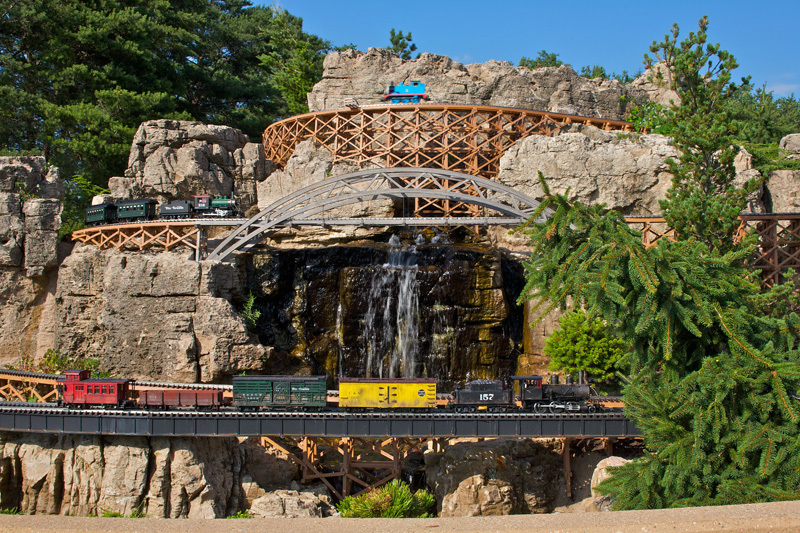 The particular placement of the stone boulders, some weighing over 16 tons, create drops in elevation for water to run down. By oxygenating the streams in this way, the circulated water is able to naturally recharge with oxygen, essential to the plants that are irrigated by this water system. The miniature landscape also created microniches for plants to thrive. Because of the remote locations of some planting areas, a variety of planting zones were able to be implemented in this project. Plants that thrive under different characteristics, for example, acidic soil or swampy conditions are able to be planted in close proximity to each other because of the niches for plantings. These “pockets” were filled with highly specialized soils, customized with each plant’s natural growing conditions. Soils were blended to emulate the plant’s natural habitat. The Railway Garden is a horticultural splendor as well. 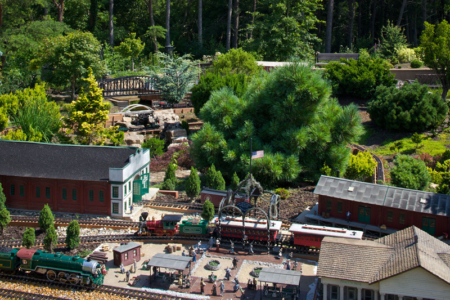 The team took on the challenge of identifying plants that would best match the scale of the railroad and scenery, and suggest a variety of natural habitats, while thriving in the particular garden setting. 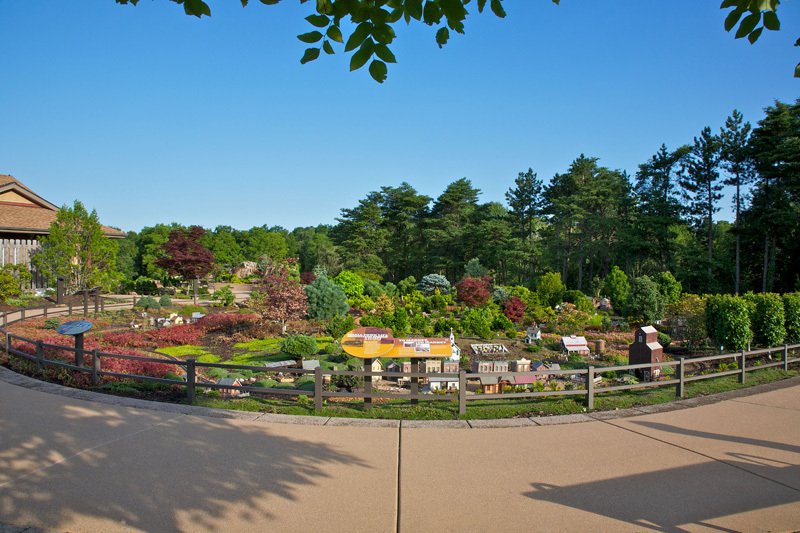 In addition, unique microclimates created by the hills, valleys, and river banks give the arboretum’s horticultural team the opportunity to grow a diverse array of plants that would normally wither in Northern Indiana’s typically clay-heavy soils. With special soil mixes, proper plant selection, and an intricate irrigation system using only captured stormwater, this garden thrives. Designers worked closely with the horticultural staff to balance the desire to increase the plant collection’s rare and unusual species with the functional and budgetary needs of the garden. More than 500 plant species/varieties and over 5,000 individual plants were planted. 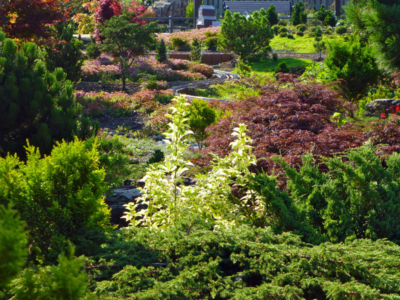 The lead designer, landscape contractor, and Taltree staff horticulturalist traveled to Oregon to personally hand pick the hundreds of dwarf and miniature conifers, Japanese maples, and other rare and unusual plants. 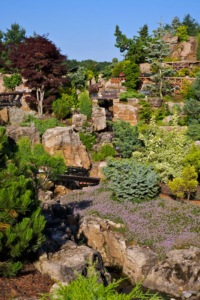 The garden is not only visually stunning, it is a very extensive horticultural collection with an emphasis on very rare miniature conifers. 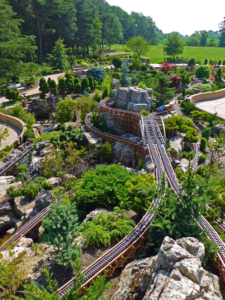 When designing the garden, not only were the immediate needs of the Garden considered, but the future care, maintenance and budgetary needs were also addressed. This forethought will go a long way to making the garden a long term success that will be enjoyed for many years to come. 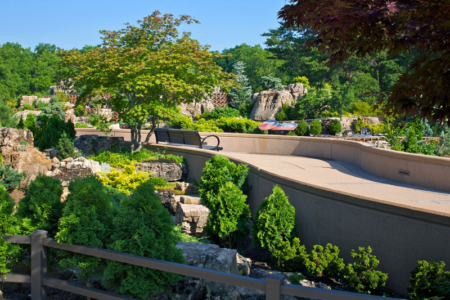 To keep the numerous plants watered and waterfalls, streams and rivers flowing, this project needed an intricate water system. Williams Creek designed a pump station and water distribution system to utilize stormwater from the on-site pond for the many water features within the railway garden and for irrigation of the site. 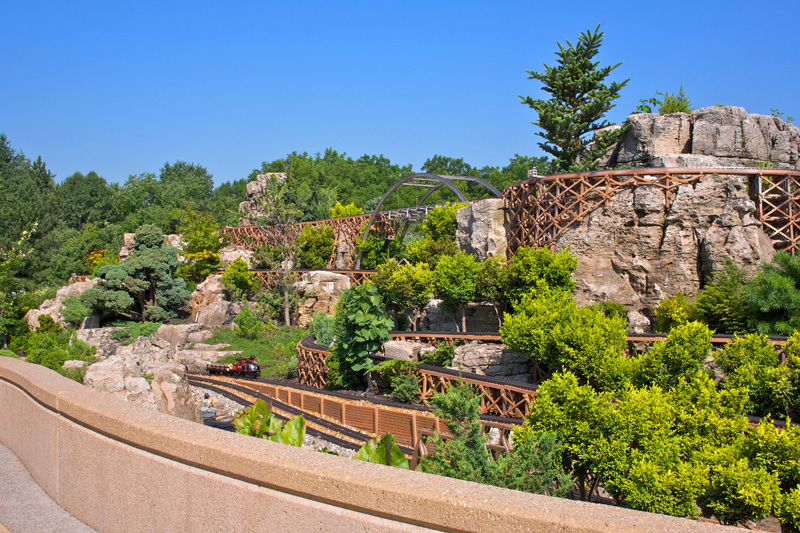 All water used to keep the precise water flow and saturation, irrigating the specialized plants, falling as petite waterfalls in delicate vignettes, and flowing in the miniaturized streams and rivers throughout the exhibit is captured rainwater. This rainwater is captured through foundation drains to capture water from the building roof and pervious concrete that was placed along pedestrian walkways to allow stormwater to infiltrate and be conveyed to a pond and ecological filter area to the northwest corner of the site. This water is stored and treated and then circulated back through the complex irrigation and stream system. An important part of this project is that it uses NO potable water to sustain it. During times of low water, a make-up line draws water from a nearby pond if needed. Overall, stormwater reuse on the site eliminates the need for municipal water, and in the process of recirculating the stormwater, also increases water quality. The operation and maintenance plan completed also recommends use of barley straw in the on-site pond as a natural, effective alternative to chemical herbicides. 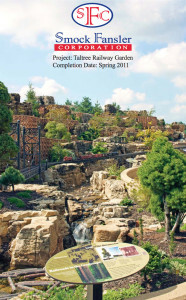 This scenic garden offers a broad range of educational opportunities. 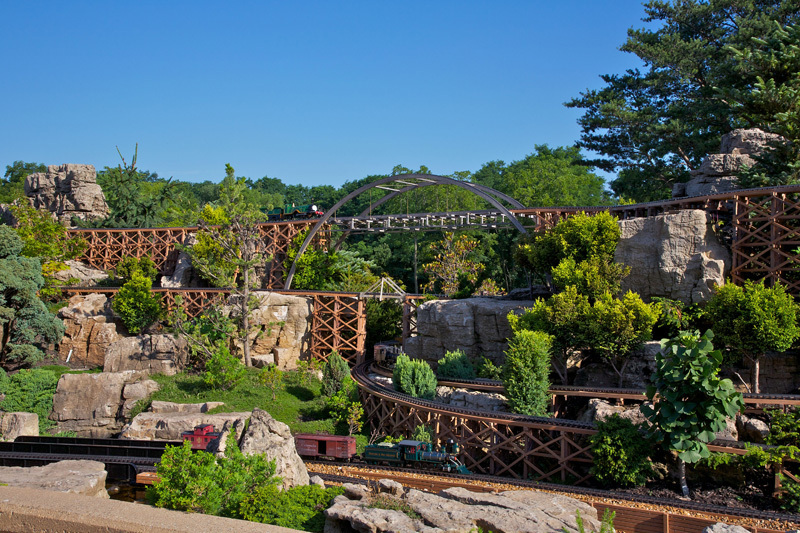 The garden was planned around a detailed narrative that explores the impact of steam railroads on the environments and culture of the United States. 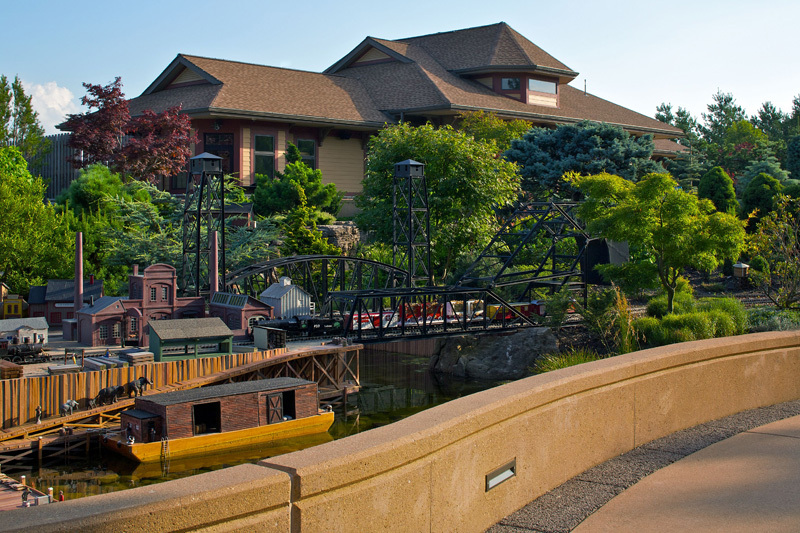 Working from in- depth research and many archival photos, the team planned and designed a variety of historically-accurate vignettes of highlights in railroad history, from the Civil War and Lincoln’s funeral, to the building of the railroad across the great plains, to a lumber camp, to a limestone quarrying showing the role of railroads in creating this Indiana-based industry. 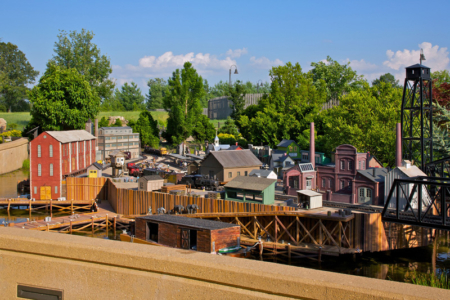 A team of volunteers, staff and consultants built the scenes, peopling them with expected (and unexpected) characters, and assuring that all the rolling stock, bridges, switching stations, water towers and other features were accurate and rendered with a high level of detail..
A stroll along the garden path is a walk through history, as brief, carefully placed educational graphics identify the time, place and main story of each vignette. Photos and text invite visitors to look more closely at the scenery, buildings and trains, noticing special activities and details chosen to tell the story in rich and compelling ways. Content available to educators as well as general viewers touches on local history, nature and the environment, technology, mathematics, and the role of the railroad in shaping our nation’s cultural diversity. Simply watching the trains as they move through such varied landscapes and settings provides educational opportunities in itself. In addition to the vignettes, the large number of landscape ecosystems represented in the garden, from bogs and prairies to alpine meadows, offered the opportunity to incorporate ecosystem education into the vignettes and at other points around the garden. By interpreting the built landscape and the micro-niches that allow certain kinds of plants to grow, Taltree aims to increase the understanding of plant habitats and the ongoing dynamic between human cultures and the natural world. At the same time, interpretation can provide insights and encouragement for visitors wanting to plan their own landscapes or increase their own garden’s diversity. 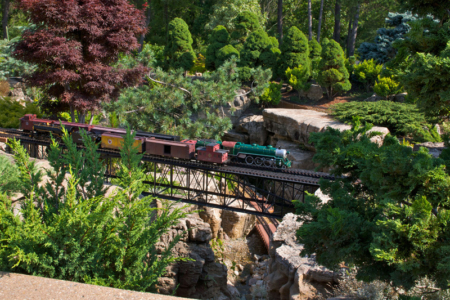 The goal of the Taltree Railway Garden exhibit is to integrate trains, vignettes, gardens, and activities into an engaging, aesthetic, and well-paced experience that also delivers a meaningful story about railroad history in the United States, particularly in Indiana.